On September 8, we’re planning thousands of rallies in cities and towns around the world to demand our local leaders commit to building a fossil free world that works for all of us. No more stalling, no more delays: it’s time for 100% renewable energy for all. We are the only generation that can solve the climate crisis — and we don’t have time to wait. Join tens of thousands of people around the world rising to this pivotal moment in history and start planning to take united, creative action globally on 8 and 9 September 2018. Thank You! As we build towards 8-9 September 2018, you'll receive emails from 350.org with more information about ways to get involved in the Fossil Free movement where you live and how to start building local people power for the mobilisation. This September, cities, states, businesses and civil society from around the world are gathering for the Global Climate Action Summit. We know what those commitments need to look like: a fast and fair transition to 100% renewable energy and an immediate end to new fossil fuel projects. 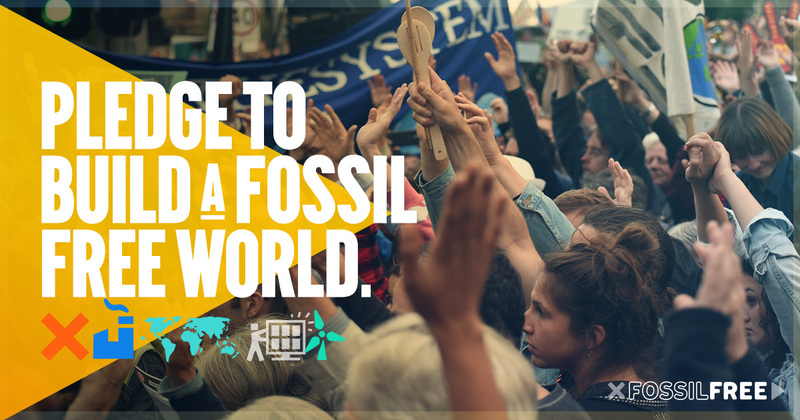 On September 8, we’re planning thousands of rallies in cities and towns around the world to demand our local leaders— whether they are attending the summit or not — commit to building a fossil free world that works for all of us. No more stalling, no more delays: it’s time for 100% renewable energy for all. By acting together, we can end the era of fossil fuels and save the climate we all depend on. The world is at an historic crossroads, on a fast-heating planet. We are experiencing the impacts of climate change all around us. As fossil fuel billionaires greedily line their pockets, our communities suffers from stronger hurricanes, floods, and droughts, polluted air, and soaring energy bills. It is necessary and doable to switch to a cleaner renewable energy future. But it’s being blocked by a dangerous and dying fossil fuel industry elites that don’t care about our communities or their workers, and governments that are too corrupt or too slow. Ahead of the next round of global climate talks in Poland in November, local governments and business leaders are coming together for the biggest event the world has seen for local action on climate change, at the Global Climate Action Summit from 12-14 September. But we don’t want more weak promises and unaccountable companies and wealthy elites to run our economies. We want a faster and fairer transition away from fossil fuels to a renewable, clean energy economy that protects workers, defends the most vulnerable, and gives people control over their energy system. A massive people’s mobilisation for a fossil free world ahead of the Global Climate Action Summit will ensure our demands are front and centre, and ringing in our elected officials’ ears as they meet in California. We are united in wanting a world where everyone can breathe clean air, access affordable energy, and lead prosperous lives free from the fear of the next climate disaster. It will only happen if enough of us join together to create more ambitious and more just commitments. There’s never been a more important moment to build momentum where we are most powerful — the local communities where we live. Sign up to be the first to access resources and support and organising a local event. Very simply, we are uniting to call for a fast and fair transition to a fossil free world, powered by 100% renewable energy for all. Of course, your specific local demands will vary depending on what’s happening in your community, town or city — and we know you will have the best ideas for what should be the campaign focus where you live. Sign up to start receiving support and resources to plan and execute a Fossil Free campaign where you live and build up to a massive mobilisation for a fossil free world this September. This global wave of action is currently being organised by 350.org, GreenFaith, CAN, OPEN and many other groups large and small around the world. If your organisation would like to get involved in mobilising for a fossil free world as a supporting partner – please fill out this form. You can start organising locally today! Neighbours, faith communities, student groups, parents, teachers, health workers, fossil fuel workers — we’re hoping that a wide range of groups will get involved in this mobilisation for a fossil free world. It’s all about local action. Sign up to start receiving support and resources to plan and execute a Fossil Free campaign where you live and build up to a massive mobilisation this September. This mobilisation is currently being organised by 350.org, GreenFaith, CAN, OPEN and many other groups large and small around the world. If your organisation would like to get involved in mobilising as a supporting partner – please fill out this form. There is nothing pragmatic about ignoring the threat of climate change. The only realistic plan is one ambitious enough to match the scale of the crisis, and to transform our society for the better in the process.